"Excellent, friendly and fast service. Was in a pinch after a flat tire on the highway and got everything taken care of"
"Very impressed. Came to my work and fixed the problem. Will use again if I never need to!" "Excellent service! Very prompt, professional, and has great communication." NO HASSLE MOBILE FLAT TIRE REPAIR AT YOUR LOCATION! First, we inspect the tire to determine whether it is repairable. Once confirmed, only the highest quality supplies and materials are used for repairs. Unlike other tire shops that might use a cheap patch kit or temporary plug, at getTREAD we follow strict safety guidelines and only use COMBINATION PLUG/PATCH kits so we can guarantee our repairs for the serviceable life of the tire. Get on your way, get peace of mind – with getTREAD. QUICK D.I.Y REPAIR KITS ... HMMM? In order to guarantee your safety and peace of mind, we don’t recommend using DIY puncture repair kits such as the inflation goo, puncture string stick (looks like beef jerky), or any other temporary solutions. Over time these methods have been shown to create wheel imbalance issues, and leak air causing low pressure conditions that could lead to a tire blowout. Blowouts are not fun, and can lead to serious injury or death – so we’d recommend avoiding these temporary repair methods if at all possible and doing it right the first time. Here at getTREAD, we value your time, and your safety. That’s why we do things right, the first time, and according to T.I.A. safety protocols. If you’re having a bad day with a flat tire, click the appointment button below – and we’ll get you back on the road in no time! BOOK WITH US FOR $69.95! Should I consider DIY tire repair kits? DIY repair kits have shown inconsistent results across different brands. Some look like sticks of beef jerky that are plugged into the puncture, and other methods consist of a thick gooey liquid which is injected through the valve stem. Results with these methods are inconsistent across different brands and may lead to slow leaks, wheel/tire imbalance, decrease in ride comfort, or even sudden loss of air pressure. NOT RECOMMENDED! We follow strict industry guidelines to ensure your safety. This means we look at criteria such as puncture hole size, puncture angle, as well as where on the tread the puncture has occurred. 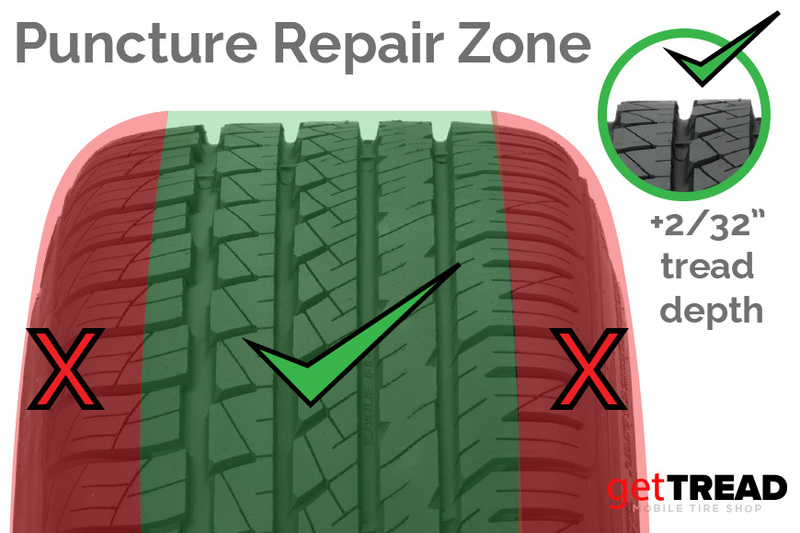 If the puncture is on the shoulder or sidewall of the tire, unfortunately it is not safe to repair. For more info, download The 3 Things You Need to Know About Tire Repairs. If your tire goes flat but you are in a dangerous area or situation, you can drive below 5 mph to a safer location within 100 yards. Keep in mind, driving on a flat tire causes rapid wear and potentially un-repairable damage to the tire, potential damage to the wheel, and worst of all – potential loss of control of your vehicle. Play if safe, we can help.